This story will break your heart. Shatter it. Into millions of pieces. I'm warning you. I should probably just start penning a book called "Jenn's Super Sad Story." Seth has been working nights and weekends (in addition to regular daytime hours). For months. Then one glorious sunny Saturday, he decided to take a break and not go in for the day, just spend the day at home. Even though I was feeling sluggish from not sleeping well and had a weird feeling in my throat, I was going to make the most of the day. So we decided to do something low-key but fun - like grill! We figured out what to grill, went out for lunch and afterwards obtained the necessary ingredients for our dinner. And once all that happened, I realized I was sick. Sore throat, headache, all that fun stuff. So I helped make these sliders, but totally couldn't enjoy them the way they were meant to be enjoyed. Instead I savored some ice cream. Since that never fails an ailing throat. So that is the super sad story about how I was sick on the one day Seth was home and couldn't enjoy these sliders and "had" to eat ice cream instead. I warned you that it would tug on your heartstrings in a profound way. That said, Seth gave me some of this meat, fresh off the grill, and I can say it was absolutely melt-in-your-mouth amazing. He insists they are the best sliders he's ever had, and still fresh in his mind a week later. He even liked the pineapple on them! And he hates pineapple! To make the teriyaki sauce: Place the mirin in a medium pot and boil over high heat. Reduce to medium low and add the soy sauce, rice vinegar, sesame oil, brown sugar, garlic, ginger, jalapeno, and orange peel. Simmer for 20 minutes. Refrigerate to cool. Once the teriyaki sauce has cooled, marinate the beef. Place the beef in a resealable bag and cover with the sauce. Let it marinate for at least an hour in the refrigerator. Preheat grill to high (roughly 400°). Lay down grill-proof griddle and allow 3-4 minutes to preheat. Working in batches, as necessary, place marinated beef on griddle and flatten out. After 30 seconds to a minute, flip the meat and let cook for another 30 seconds to a minute before removing. Both sides should be browned and only slightly charred. Brush onion slices, pineapple slices, and cut sides of rolls with canola oil. Place canola oil in a small bowl. Using a paper towel or cloth, dip in canola oil and rub over hot grill grates to prevent sticking. Grill the onions and pineapple on high heat until they have a light char on either side. Place the rolls, cut side down, on the grates, and remove when lightly toasted. To assemble the sliders: Place a lettuce leaf on bottom slice of the bun. Then layer cucumber slices, grilled pineapple, meat, grilled onions, jalapeno slices, scallions, radish sprouts, and top with a drizzle of Sriracha. What a pity that you couldn't have these gorgeous sliders. They look lipsmackingly good. My gosh these look so freaking cute. I don't eat beef but I'd totally make it with salmon instead because it sounds incredibly tasty. I hope you're doing better! If not, self-medicate with more ice cream! Sliders mean I can eat more than one, right? Those look like awesome sliders. That first picture is GORGEOUS! My mouth is watering just look at these amazing sliders. Hope you feel better soon hun. Aw, you poor thing! I hope at least you got to sample some leftovers when your throat felt better. These look amazing, Jenn! I hope you feel better soon! These look so delicious. Hope you're feeling better! I certainly feel for you, these sliders look amazing. i love the addition of the pineapple to these sliders! Awesome recipe! I feel so bad you couldn't enjoy them. I love the addition of pineapple, great touch. Blogger no longer recognizes my ID. GREG is Sippity Sup. Tis is soo good. It look good, it sounds good, I bet it tastes GREAT! Perfect timing for these grilled teriyaki sliders. I made buns today and can't wait to try this. Leave it to murphy's law to strike again! They do look majorly delicious. Oh how sad, at least you had ice cream though! These sound absolutelystupendouslyamazing! To bad, they look delicous. I can completely see why these are melt in your mouth--YUM!! Oh wow - those are some giant sliders! 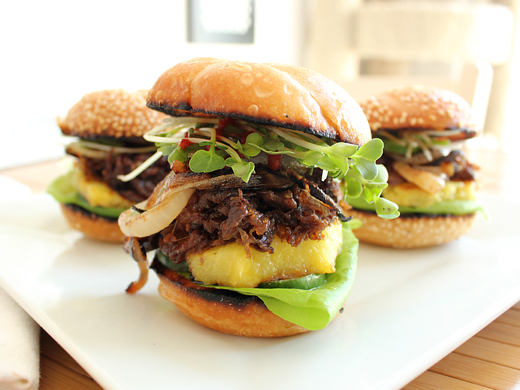 Great classic pairing of teriyaki and pineapple and the beef really does take it over the top. I have been dying to make a good burger -- this is it! Looks incredible! Oh my goodness, these sliders look like pure heaven! Wow! I love all the combination of flavors and textures here! That is wonderful burger! So not fair! Illness hits at exactly the wrong times. Clearly, you'll have to make these again. The teriyaki sounds so good, and the sriracha sauce on top is calling my name. I'm sorry you didn't get to enjoy them! My mouth is watering just looking at them! I like ice cream when I'm sick too. Hope you're feeling better! Sorry you couldn't enjoy that day and these amazing burgers... but the ice cream is not so bad!! Oh no! I would be very sad if I didn't get to enjoy these delicious sliders! They look incredible! Boo! That totally stinks that you had to eat ice cream instead of these meaty beauties. They look amazing. Too bad I live all the way over on the east coast, or I would have been Jenn for the day (well, I am Jenn, but you, Jenn). Now I'm on the hunt for waygu beef. Usually I love to eat ice cream but when I HAVE to eat ice cream that's a whole different story. Hope Jenn is better and Seth makes more sliders to nosh on. It looks so good I can almost smell and taste it through the screen! Lately I've been addicted to the teriyaki beef + pineapple burger at Habit Burger. It's so good. I didn't think about making it at home but now after seeing your photos, why not! Your burgers look 100x better than one I like at Habit! Delicious recipe. Thanks for sharing this recipe. 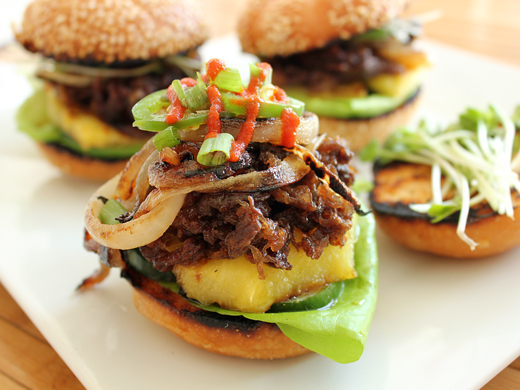 I love all the combination of flavors that you used and this tasty grilled teriyaki wagyu beef sliders . I never eat this burger that have combination of different flavor with wagyu beef. test for the best of the delicious dishes of beef lovers you can follow us at :-There are many beef lovers available all around the market and it is something that is known for the popularity and different unique recipes. The japanese wagyu cattle is something that has grown in demand in the past few years drawing the attention of all foodies around the world. With wagyu steak you can sit back at home and order the best of items delivered.